Washington Law Protects Against Suspensions for Walkouts. On March 14, 2018, students across the country are planning to walk out of school to protest legislative inaction to prevent violence in our nation’s schools. These efforts prove, yet again, that youth can and will be at the forefront of major social movements. Yet, some school administrators have chosen to respond to their students’ civic engagement with threats of suspension or other forms of school discipline. It’s important to keep in mind that students don’t shed their constitutional rights at the schoolhouse gate, including their right to free speech guaranteed by the First Amendment. Students’ First Amendment rights aren’t absolute, though, and schools can punish students for actions (including protests and walkouts) if their speech or protest interferes with the orderly operation of the school. Because schools have a legitimate interest in ensuring students are in class (and because state law requires students to attend school), schools can apply their ordinary attendance policies for absences when students walk out from school to participate in a protest or other political activity. But Washington law doesn’t give schools unlimited discretion to punish students for missing school. In fact, as a general rule, if students in Washington engage in a walkout, any discipline should take place only in school. In-school discipline can include detentions, community service, parental notification, meetings, and conferences. Under Washington law, schools cannot suspend a student to punish a first-time unexcused absence. Schools can only use suspension to punish behavior if the student has previously had an unexcused absence and the school has already tried another type of discipline to address the student’s absences. So, unless a student has already had an unexcused absence and already been disciplined for it, the school shouldn’t respond to a walkout by suspending her or him. Schools also can’t punish students who walk out more harshly than they do students with other types of unexcused absences. And the discipline cannot be based on the message of a protest. Schools can’t treat students who walk out to send one type of message (like support of restrictions on firearms) differently than they treat students who walk out to send another type of message (like opposition to restrictions on firearms). Many youth are deeply politically engaged, passionate about their beliefs, and not afraid to take a stand on school grounds or off. Just because schools can discipline students for peaceful protest actions does not mean they should do so. Rather than disciplining students for absences, schools can engage in a robust discussion about the First Amendment and civic engagement. Student protest isn’t insubordination – it provides an opportunity for education. If you are a public school student in Washington state and believe that school authorities have violated your rights to free speech, the ACLU wants to hear about it. Please contact us at 206-624-2180. 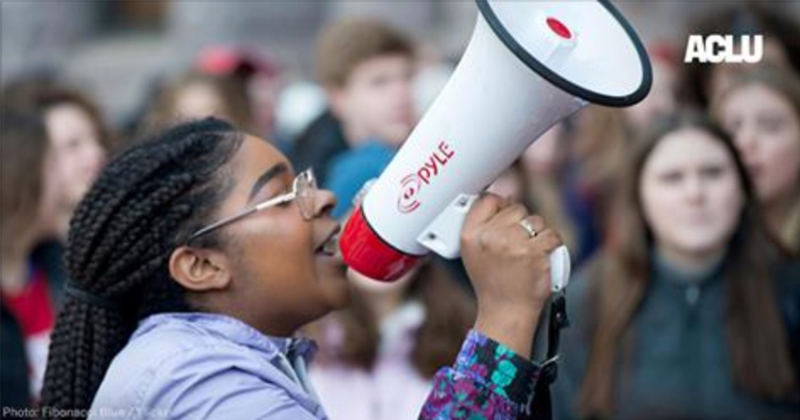 To learn about student free speech rights, see the ACLU of Washington publication Know Your Rights: Student Political Speech, Protest, and Walkouts. The ACLU recently held a nationwide online training on student free speech rights. You can watch a recording of the training.